London to Vietnam in a home made truck! I'm writing this post in Margao, Goa as the springs on our truck are being fixed. Mark is at the workshop overseeing the work. The rear suspension on our truck is provided by two sets of leaf springs, both of which should look happy! Literally, the springs should make the shape of a smile if they are in a good condition, and if they're not they are either flat mouthed or miserable. Ours are not quite miserable yet, but if we continued any further with them they would be. So, 40 quid later and one day's labour and we should be out of here on our way to Hampi. I'm aware that I need to update you on 4 months worth of our travels and I guess I feel slightly daunted by the task, although I know it's my own fault for no having done it sooner! So, here goes. November was really a month of relaxing and preparation for the arrival of our family. They were all arriving in December, but they were coming for a month and we wanted them to see more than just Goa. It is a beautiful part of India but it doesn't give you any idea of the other side of Indian life. Deciding where to go, how to get there, where to stay and booking it all was a lot of work. It meant a visit to the internet cafe sometimes twice a day. We also had to book accommodation and set up our camp ready for everyone to arrive. We bought a new table, put up a washing-up area outside, hung our two solar showers and bought enough bowels and buckets to wash dishes, feet and hands and fetch water from the local well. We had bought some large canopies in Gujarat and suspended them from the palm trees so that we had enough shade during the day. We bought mats for outside and we had a huge rug we had bought in Jaipur to lounge on. Our parents being all over 60 now needed decent chairs to sit on, so we rented three chairs from a local restaurant for whilst they were here. Fatima's restaurant also helped us get a large gas bottle which we set up outside to a burner we bought in Rajasthan. The only thing we needed then was enough plates and bowls to eat from and cutlery. We had hired a scooter at the beginning of our stay for 1.50 a day so we spent a good few journeys to Chaudi, the local town to get all this stuff. We also used this for getting our water. The well is around 2 minutes on the scooter but you need it to transport the water. We used two 20 litre containers, like you would have in a water dispenser at work and a metal well bucket. This has a lip on it and you tie a rope around the lip and throw the bucket down and move the rope to flick the bucket over in the water and fill it before pulling it up and decanting it into the two containers. The well was also a favourite place of ours for a wash. It was in the middle of the palms and forest and rarely was anyone about. We would take our shampoo and stuff and soak each other in water and have a good wash! It's not so easy to have a good wash under a solar shower in view of others! We used the solar showers mainly to rinse off after the sea. Not having running water is the biggest issue you have when you are static. For our drinking water we had a water man that delivered full containers and collected empties every few days. Anyway, enough of the housekeeping!! Apart from the setting up and preparation work we did relax and spend time on other things. I had set myself a target of swimming to 'the rock' and back everyday. In the middle of the sea in front of us was a biggish rock that seemed a perfect target to swim to. Mark actually measured the distance by putting the GPS in a waterproof bag and swimming there and back with it. When the tide was high it was approximately 750metres. It used to take anywhere from 15 -20 minutes depending on the tides and currents. My favourite time to swim was just as I had woken. It would normally be just before sunrise and I would wake, put on my bikini and goggles and walk the 50 steps to the sea's edge. The sea feels warm at that time of day. The first few times I swam I was a little scared to be out in the deep sea by myself, but I got over it quickly and just enjoyed it! The best bit about going early was that as I swam back towards the van the sun was rising over the hills behind and lighting the palm trees. Mark used to watch me from the shore as he made the coffee. We enjoyed our morning coffee together and watched the day get brighter and brighter whilst waiting for Matthew the baker. He came everyday and brought fresh bread, vegetable, egg, apple and chocolate pastries. He was a very sweet man and of course everything was very cheap. How idyllic - camping on the beach with water deliveries and your own baker! We had been looking for some yoga to do since we were in Nepal, but hadn't found anything suitable. We had heard there was some yoga near to us at Fatima's guest house. We went and met Deepak the guy who was teaching and asked if we could join the classes. He was running teacher training courses and sometimes offered drop-in sessions if he had room. He had taught our friend Simon the year before, so we were keen to go. It was our first yoga and it was hard work! The session lasted almost 2 hours and was the Ashtanga Primary series, which is a very athletic form of yoga. It is also called power yoga at home and in the US. But, it was really enjoyable, so we went 5 days a week, me swimming before it as well! We did it in blocks - 2 weeks of going and then 2 weeks off as our parents arrived, but Mark had an abrupt ending to it in the form of broken toe! Our friends from Nepal had arrived by the end of November. Stefan and Petra arrived first and then Marion, Patrick, Marla and Luis and Suzanne and Adrian. It was the end of a day and Mark had decided to have a wrestling match with Luis, Marion and Patrick's son. He slipped on a mat and fell awkwardly on his big toe and broke it. We went to the local hospital where it was put in a cast. He needed the cast as in a few days all of our family were arriving and we had to fly, train and bus around southern India. I think I last left you with the preparations we had been making to receive our family in Goa and with the fact that as I was writing the suspension on our van was being fixed. It’s been a few weeks since then and I now have even more to write about! I’m sat in front of the Bay of Bengal, in the van on the computer, but no internet access so I can’t really remember where I actually left off. I do know that I haven’t told you of our family visit and it seems a good place to start. We hadn’t seen our family for 18 months and had both changed somewhat in that time. I think the most startling change has been our weight loss; Mark probably three stone and me probably two! Either way, they were pleased to see us and us them. We had a few days on the beach and then started our little tour of a small section of southern India. We flew to Bangalore from Goa and then took a car to Mysore. The drive through rush-hour Bangalore was an eye-opener for everyone. The roads here are very crowded and carry a whole host of vehicles; buses, trucks, cars, motorbikes, scooters, bicycles, horse and cart, oxen and cart and of course pedestrians, some of whom are walking their goats, buffalo and cows home. It really shouldn’t work, but somehow it does. Of course there are many accidents and many fatalities, luckily we saw none that day. We simply held our breath many times and wondered out loud in amazement at the near misses and the organized chaos of it all. Five hours later (did I mention it was rush-hour?!) and we pulled up to the Green Hotel in Mysore. This was to be our resting place for the next two days and is an old colonial building that is still used as a film set. We showered and met on the lawns for drinks and dinner. Very civilised! The next day we visited the Maharaja’s palace which was suitably opulent and beautiful. As we wandered the grounds we were taken by a police officer to see the Maharaja’s elephants. They are incredible animals. We had heard a story before about elephants being given as gifts as a punishment. Apparently if your local ruling gentry really wanted to punish you after you had performed some crime or misdemeanor they would give you an elephant. The feeding of such a creature would surely bankrupt any normal person and they couldn’t be killed as they were a gift from the royalty! Anyway, we were offered pictures on the elephants and then of course asked for baksheesh. We left the palace and our tuk-tuk drivers took us to a silk and sandalwood shop. We shopped well and made our way that afternoon to the Tipu Sultan’s summer palace. Mysore, like many places in India has a history of rule by both Muslim rulers and the Maharajas meaning multiple sights for people like us to visit! The next day disaster struck as my mum was the victim of some bad bacteria in her food. We left her in bed that morning and visited Chaumundi Hill, a home for many temples, a huge statue of Nandi, Shiva’s bull and consequently many Hindu visitors. On our return she was no better and we left her and my dad behind to sleep it off at the Green hotel whilst Mark’s mum Sheila, Mark, myself and Jordan took a car to Mettupulayam. This town is really nothing more than a railway station and hotels. Sheila and Jordan had their first experience of budget accommodation in India and we tried to sleep that night with the background din of budget hotels and air raid sirens that went off on the hour from 4am to remind people in the town to get up for their trains!! We were to get a steam train from Mettupulayam to Ooty – the old British hill station that the Colonials used as their get-away from the stifling summer heat. It was actually knick-named ‘Snooty-Ooty’! The steam train travels up 2500 meters over 46 kilometers and takes four hours. It is a very picturesque ride and takes you over big waterfalls and through the Nilgiri Hills, home of many tea plantations. We had booked into an old-style British bungalow 7km out of Ooty in the hills called the Sherlock. As we arrived that afternoon we had tea on the lawn in the beautifully kept gardens and waited for my mum and dad. They had taken a car directly from Mysore to Ooty. We had log fires in our bedrooms and throughout the hotel and we needed them! The old colonial powers had used this place as their summer retreat, however we were here in December and it was cold in the evening. The hotel had warned us to bring warm clothes, which we did, however their preparations for the cold were not as good as ours. It was a shame as the hotel was great and we enjoyed our food and the scenery but it was too cold. The management were sympathetic in the end and gave us a good discount on our bill, but it was a bit disappointing. That aside, we really enjoyed our time in Ooty. We visited a tea factory the day after we arrived and saw the raw green leaves being transformed into the fermented brown tea we know and love. The day after we had a great walk (minus Mark due to the broken toe) out into the tea plantations through a massive Eucalyptus forest with fantastic views for miles around. We were at 2,800 meters, the highest point in the Nilgiri Hills. Our time had come to leave and we took a car from Ooty to Bangalore and ate in Bangalore that night. The next day we were up before the dawn and made our way to the railway station to pick up the train to Goa. Our train was actually a sleeper going to Mumbai – a whopping 36 hour journey – but we only had 12 hours on board. We had a whole section to ourselves with bunk beds and lots of space. The chai, coffee, dosa and idli wallahs were coming round regularly, so there was no chance of going hungry. After a car ride from the station we were back in Agonda. How nice it was after all that travel to be back at the beach! The trip had given my mum and dad and Sheila and Jordan a real taste of India; the variety of it, the size of it and the number of people living in it! It was nearly Christmas by this point and the next day we relaxed and put up our tent so that Jordan could camp with us on the beach. Christmas on the camp was a busy one. By the time we had arrived back from our tour many more trucks and cars had arrived and there were 22 in total! We may have mentioned this before, but most of the trucks and people we have met traveling overland have been Germans. They celebrate Christmas on our Christmas eve, so we had in effect, two Christmases! On our Christmas day Mark, Jordan and I were up early. We had coffee and short bread biscuits and Toblerone for breakfast!! It was a normal day by our standards; the sun was shining, the sea was like a mill-pond and the puppies were play fighting on the big expanse of sand in front of us. We started prepping the veg for Christmas dinner and Mark and Jordan went off to get the chickens. Getting the chickens involved picking which ones they wanted killed and then waiting whilst the guy rung their necks, shoved them into a huge old oil barrel until they beat the life out of themselves, skinned them and whilst the flesh was still twitching chopping them into pieces! Happy Christmas indeed! Still, it doesn’t get fresher than that and they tasted good. We treated them well and marinated them in tons of garlic, ginger, lemon, salt and chicken masala. They were barbequed to perfection and accompanied with char-grilled vegetables and potato salad with home-made mayonnaise. My brother Angus had arrived late the evening before and his room had a fridge in it. For the first time in a long time, Mark and I enjoyed chilled white wine and a family Christmas dinner. Angus, Sheila and my mum and dad had all brought cheese, biscuits and port with them. That evening all the overlanders built a fire on the beach and we took our chairs down to it and on two tables we laid out stilton and cheddar cheeses, biscuits and bread and two large bottles of port. It was our Christmas gift to everyone there and they loved it. The Swiss and the Germans never realised we had such good cheese!!! The next days flew by filled only with eating out, sun bathing, book reading, socialising, yoga, swimming, cycling, games of boule and so on. We had a boat trip out to see the dolphins – visible from the shore too, and we saw loads. We celebrated the new year at the Cinammon club restaurant and on the 2 January we said good bye to our lovely nephew and Sheila. It was also my birthday and Mark and others on the camp had set up a great surprise for me. Mum and dad took us out for dinner at the Dunhill restaurant where we enjoyed fresh strawberry daquiris and when we went back to the camp I was treated to a pyrotechnic display. They had strung up between two palm trees ‘Happy 38th Birthday’ using wire and rope soaked in paraffin. It was set alight whilst fire works were set off. I was very overwhelmed by it – what a treat. I had two birthday cakes as well and everyone enjoyed it. By now we had more friends arriving. Simon, Handan and their daughter Zola arrived with their tent and set up next to us. Gina and Simon whom we met in Turkey when they were overlanding in their bus arrived, not this time in a bus but back-packing. The funny thing was, when we met them in Turkey it was August 2009 and they had been to India back-packing before and said to us we should try Agonda – they remember seeing campers parked there before. They couldn’t believe we were there 18 months later! So, we enjoyed more time together. Mum, Dad and Angus had got themselves a regular breakfast restaurant in Lilly Moons where Simon and Gina also used to go. We enjoyed our coffee mornings with Simon and Handan at the camp and I was still yoga-ing and contemplating whether to join the next teacher-training course that started on the 18 January. It was also decision time for us. We had a commitment to be home in May for my cousin Jane and David’s wedding and for June for my cousin Sarah and Ed’s wedding. We had contemplated flying home and carrying on traveling and returning to Nepal to teach English voluntarily and then coming home. The other option was to come home in May with the van and then going off teaching abroad afterwards. We decided to go with this and then we heard that the Pakistani embassy in Delhi was not issuing Pakistani visas to any foreigners. Our German and Swiss friends had had to send their passports home and then have them sent back to get the visa at their home embassy. We decided to give this a try and thought we would send them home with my mum and dad and then my cousin Sarah was coming out in February and could have brought them with her. However, after some more research it was apparent that for British nationals the rules had changed substantially and we would need to provide bank statements, sponsors in Pakistan and a letter of reference from our employer stating when we were expected back at work. Clearly the last requirement proved difficult for us and its absence would have required us to go in person to the Pakistan embassy for an interview. We didn’t really fancy the idea of being stuck in India with no passport and our passports being with the Pakistani embassy pending an interview! So, we had to look at another option. At this point we threw caution to the wind and decided that if going through Pakistan was going to be that difficult maybe we should pick up on the winds of fate and take the other route overland – through China. We are now researching the tour agencies who can take us through China – you can’t go alone as you are required to have a Chinese guide in the car with you at all times. We’ve booked our flights to London from Kathmandu and will be returning home for a holiday for 6 weeks!! Back to Goa. Mum, Dad and Angus had all left us by the 11 January. They’d all had a lovely holiday and it was a great month with some ever-lasting memories. We were sad to see them go. Sheila and Jordan were already home and one of the first questions Jordan had asked his mum was how old did he have to be before he could fly alone?! It was decision time for me regarding yoga. I had started doing it in the middle of November and loved it. But, the course was a different kettle of fish. You may understand my reticence when you consider the requirements; getting up at 5.45am taking a cold shower, 6.30-7.45 in class doing pranayama – breathing exercises, 8-10 Ashtanga primary series yoga, 10-11 breakfast and then 11-1pm philosophy. 1-3pm was lunch break, but we were back at 3-4.30 doing anatomy and alignment and then from 4.30-6pm doing hatha yoga. This was Monday to Friday and Saturday was to be the same morning but finishing at 10am. For someone who has done very little for the last 18 months it was a daunting prospect, plus I had some great friends on the camp who I wanted to spend time with and my cousin Sarah and her friend Jane were coming out for 10 days. I knew I would have homework and study outside of the course as well. Did I come traveling to do this or to relax? The truth is I didn’t know why I had come traveling apart from the fact that Mark wanted to and I couldn’t think of anything better to do! When would I have the opportunity again? What was the worse thing that could happen? I signed up for the course! The only showers we had been using on the beach were our solar ones so the first morning I was up at 5.45am and dawn had not broken. I stepped out of the van door with my torch, but I didn’t need it. It was a full moon that night and it was just going down. It was beautiful. This huge globe of white with its craters and mountains obvious, was just hovering above the horizon and lighting everything with its beautiful white glow. I finished showering and had my coffee gazing at the moon and the silvery sea. I don’t know if I can do justice to the course here – it was such a wonderful experience. There were only 13 of us on the course – I think it was the smallest of all of them – and they were all great people from all over the world. We shared ideas, laughs and tears and grew together – it sounds so clichéd, I know, but it was true. We were taught by Deepak and Shiva but we learnt a lot from each other. I shall never forget it. Half way through the course my cousin Sarah and her friend Jane came out to visit. We booked them accommodation at the nearest guest house; Mycinta’s, so they were only one minute away. They arrived on the Friday and on Saturday morning we all went to yoga, had breakfast and went to Margao material hunting. Mark borrowed Patrick’s motorbike and took Jane and I took Sarah on the scooter. It’s a lovely ride to Margao on the coast road. You go through jungle, past river inlets and more beaches, over volcanic scrubland and through fishing villages before reaching the town. We spent our time in Raymond’s suitings and shirtings shop where Mark was having his suits made for the weddings, in the material shops, the Bombay café and the spa. It was a good day that ended back in Agonda at Simrose restaurant where Ricky our waiter was only too happy to serve us lots of Kingfisher!! Those ten days went very quickly. Sarah and Jane came to yoga every day, sunbathed, shopped, got Ayurevedic massages and treatments, enjoyed a cooking course with Deepak’s mum and the rest of the yoga course, enjoyed being a part of the community on the camp and were great company for us too. We were sad to see them go. I completed my yoga course on the 18 February. We had a fire ceremony at our ‘graduation’, took many photos and had our last breakfast together. I can’t take all the credit for completing the course. Mark was a great support throughout and made sure all the housekeeping was done so that I could just get on with my yoga. We then had until the end of February to enjoy the beach and the company of our German, French, Scottish, Austrian, Australian and English friends! The time came for our friends Amelie and Til to go. They went, taking their lovely son Theo and their two dogs Ole and Ford. It was an end of an era. We had met them in December 2009 and camped together in Agonda and Nepal and Agonda again. Then it was everyone else’s turn. Saying goodbye to our friends Marion, Patrick, Marla and Luis was also very sad. Our French friends Lamy and Manu moved next to us and we enjoyed our last few days with then. The time came for us to leave, or so we thought. We headed to Margao to fix our brakes and the aforementioned springs, but it was to take longer than the one day expected. After the brakes were fixed we spent a night on Colva beach where we met an Australian woman who was traveling on a motor bike across to South Africa. We returned the next day to get the springs done, but just at the last minute as the bolt to secure the springs was replaced, we realised that the thread had rusted and we needed a new bolt. Guess what? They didn’t have one the right size! We actually spent that night camped outside the public conveniences, which was where the guys had asked us to park our truck to fix it!! The next day we had to wait for a bolt to come from Vasco and by 8 ‘o’ clock that evening it was finished. Spend the night outside the toilets or go back to where we know and love? Agonda it was. We had become a running joke in Agonda by that time as we always seemed to return and never managed to leave when we said we would. True to form it took us another three days! We were alone again on the beach front, just like in November. We finally left Goa on 13 March. That’s four and half months on the beach. Not bad huh? I think we shall love that place forever – the times we had there are etched into our brains. In the future whenever I have hard or difficult times, I shall think back to those fantastic four and a half months; the place, the people, the animals, the sunshine, the moon and stars, the sea, the jungle, all of it. As was expected we have reached the beach and neglected the blog! We have actually been quite busy, preparing for the imminent arrival of our family and setting up camp. We left Pokhara behind on 19 October and the kilometres clocked so far stood at 25, 260. We saw our last view of the Fishtail mountain and some others in the Himalayan range and set off. Since Sarah and Ed had returned our laptop to us we had reloaded the Ipod with 2,500 new tunes and were looking forward to a new musical soundtrack to our journey. Highway 28c took us towards the border post at Nepalgunj and we stopped our first night just past Butwal near a school in a forest. We kept the kids entertained with badminton raquets and a football and had some dinner before heading to bed. The next day we arrived into Nepalgunj early afternoon, but knowing that the road after the border was one of the worst on the journey and had nowhere to stop and sleep, we stopped in the border town and planned to cross first thing in the morning. Border towns are always busy places, so earplugs at the ready we managed a good night's sleep. We arrived at the border the next day only to be told by the Nepalis that it was closed on the Indian side for two days due to elections happening in Uttar Pradhesh. People were being allowed through on foot but no vehicles were allowed to cross. The customs man didn't want to sign our paper work to exit as we'd have been caught in no-man's land in between the two countries for two days. We decided to approach the Indian border control and ask if we could cross. We didn't believe that a British car crossing the border could have any impact on the elections. The man from the border post said 'yes', so we walked back to Nepal and got our paper work signed and our exit stamp in our passports. There's about 1km between the two border posts and its full of little shacks, hundreds of people on bicycle, horse and carts, rickshaws, trucks and at this point in time a rather strange looking green and grey van carrying yours truly towards India. The barriers were raised, people were moved aside and we were waved through. After our passports were stamped, our Carnet de Passage filled in and stamped (customs paperwork) we entered India for our third time in twelve months. The first stretch of road is so pot-holed, it is tiring to drive. We did our usual pattern, which is two hour driving shifts each, and we were happy to reach the capital of Uttar Pradhesh that evening. Lucknow at night time is actually a treat. Everyone was out as the elections were on and so the streets were busy. The lights illuminating cafes, shops and restaurants, the sweet smells of boiling milk fragranced with cardamon, the savoury smells of samosas being deep fried mixed with the sour smells of rubbish and the polluted river all added to the experience. We stopped just passed Kanpur that evening and the next day passed through Agra to stop 150km west of Jaipur, the capital of Rajasthan. The next morning we were on the road by 6 and were driving past the familiar rocky hills of the Rajasthani desert landscape. If you want to see some of the proudest handlebar moustaches and beautifully coloured turbans in the world, this is your place! We were putting in the hours. The lure of the beach and friends was too much plus the fact that we had developed a problem with the starter motor. We now stopped each evening near a hill so that we could push start the next day. The only problem with this was that once started, we couldn't stop the engine until the end of the day! When we stopped for breakfast one of us stayed in the car as the other jumped out and ran and got chai, samosas, pakora, biscuits, bananas and the like. We have in fact become experts on samosas! Those little golden triangles of delight are very different to the greasy flat offerings at home. They are more a pyramid of short crust pastry filled to bursting with spicy potatoes and vegetables. They flavour and spice them differently at each stall you arrive at - so you never know what to expect. We probably looked like samosa by the time we arrived at Agonda! It took us around 5 days - can you believe it?! Mandy and Steffen were actually asleep when we arrived at 1am, but not for long! After a couple of hours chatting and a few beers later, we were asleep. The next morning was everything we wanted. We woke to the sound of the waves lapping on the shore and the sea breeze coming in through the windows. As we opened the door and looked through its frame we had the beautiful deep blue of the Arabian Sea with the newly risen sun sparkling on its surface. The palm trees, the volcanic rocks, the green hills and jungle bring a rugged beauty to this beach. We made coffee and sat on the beach just taking it all in. We enjoyed a great 5 days with Mandy and Steffen before heading to Assagao in northern Goa to see Amelie and Til and celebrate Til's birthday. A few days here; dinner on the clifftops at Little Vagator with a stunning sunset, great juices at the juice bar in Chapora, meeting new friends and old in their gracious old Portugese villa and just hanging out. We returned to Agonda; this time we were alone, for a month until the next Overlanders joined us. In the next blog update I'll give you the low-down on our 4 months in Agonda, but for now, that's all folks!! We have just waved goodbye to our cousin Sarah and Ed after completing what can only be described as the experience of a lifetime. As you can probably tell from the title of this blog we all managed to trek and climb to the Annapurna base camp at 4130metres (for those of you who haven’t quite gone metric, that’s 12,390 feet!). This of course was the pinnacle of our trek, but like every journey it has a beginning, an end and great experiences along the way. I’ll start at the beginning. Sarah and Ed flew to Pokhara from Kathmandu and after we missed each other at the airport, we found each other in a restaurant on the lakeside in Pokhara. After hugs, kisses and beer we returned to the campsite in Pame and promptly erected the tent; they wished to sleep under the stars and see how we lived in the van! The first night in the Nepalese countryside was certainly an experience. The mosquitos and leeches smelt fresh blood and had a little feast on Ed and Sarah, whilst we gorged on the gourmet snacks and red wine! After a day relaxing in Pame we ventured into Pokhara to organize our trek and pick up the remaining gear we needed. We had originally thought to do the trek without a guide; it’s a very well-trodden route and the permits and trekking passes give you access without an informed guide. However, after realising that the difference between having a guide or not was 5 pounds a day for all four of us, it was a no-brainer! The guide was hired, the equipment bought and hired and the taxi booked for the next morning. We returned to Pame to pack, eat and sleep. That evening Marion cooked a huge pot of soup and we all ate at their van. Sarah had bought some truffles and waffles from Fortnum and Mason and a lovely bottle of Port. We took them over to share – you can’t believe how good they tasted! We set off the next morning as planned and met our guide, KB. Our first day was trekking from Nayapul to Gandruk. It was a seven hour day, mostly uphill and brought with it beautiful valley views but no mountain views, yet. We were at 1950 metres at the Trekkers Inn Hotel for our first night. After a filling Nepali dish called Dhal Baht (rice, lentils, vegetables, papad and pickle) we headed off to bed. The next morning we awoke for Sarah’s birthday and an awe-inspiring view of the Himalayas. We were on the top of the hotel with a big balcony in which we all stood mouths gaping at the stunning Machhapuchhre, fishtail mountain. It has an almost text-book peak which twists. The Annapurna South mountain which stands at 7,129metres was to its left and leading up to these glorious white peaks were a set of dark green valleys, full of newly forming clouds drifting up towards us. After breakfast our guide showed us the valleys we’d be walking through and informed us that the base camp was the other side of Annapurna South. We got a vague idea then of how far we were going. I think in total we walked 75-80 miles, but that doesn’t really give you a good idea of distance as you go up and down so much to snake through the valleys. That day we trekked for 8 hours from Gandruk to Chomrong. We chatted our way through villages, over rivers, and bridges, past water buffalo, goats, sheep, other trekkers, porters, donkeys and cyclists! It was a tiring but great day and we ended up at the Himalaya View Guest House. We celebrated Sarah’s birthday with a whiskey and coke and sat on the balcony of the guesthouse watching bright blue birds fly between the trees. We had a gaping set of valleys in front of us; the sheer scale of Himalayas really strikes you, that and the incredibly varied countryside and wildlife. We all had a fantastic shower at the guesthouse, hot and powerful. It was just what tired and aching muscles needed, and this was only day two! After dinner we sat chatting, and it was then that we realised that we hadn’t brought with us as much money as originally thought. Our guide borrowed some money for us, thankfully he had a lot of contacts! The next morning was just as spectacular as the last, but the great thing was that we could see we were closer and our changing perspective of the mountains was illuminating. We could see from here the twist and twin peaks of the fishtail mountain, soaring 6,993 metres into the air. The sky was a brilliant blue and again we had the view of the next deep green valley we were to walk that day. This was to be the day of steps. We had slept at 2,170 metres at Chomrong and were to stop at Doban at 2600m, however we descended at least 500m before starting the ascent of almost 1000 metres. It was a pretty tough day but the scenery had been stunning. We were walking through rain forest and deep, deep valleys. From almost every nook, cranny, crack and crevice in these fierce hills and cliffs came waterfalls. The sides of the valleys were scarred with a series of landslides, in which some incredible pieces of rock had been moved. It was a geologists dream. The different layers of time evident in these rocks brought an appreciation of the natural history of our planet (and distant memories of geography lessons!). We stopped that evening in the Annapurna Approach Hotel. We met a guy named Peter from Switzerland who had first travelled to Nepal overland 25 years ago. Meeting people in the guesthouses was an unexpected bonus on the trek. In the evenings everyone would gather in the dining-room as it was pretty cold; we were already wearing puffer jackets and thermal underwear! There was a feeling of excitement about going to the base camp and at the end of each day you really felt chuffed that you’d come that far and were going higher. Our fourth day was a climb of 900metres to the Macchupchre Base Camp, MBC for short, at 3700metres. It was the day when we really experienced the change in altitude. We were almost drunk or high at times. It became very surreal when we emerged out of the rainforest into much wider valleys where the surroundings became more Scottish; rust and brown coloured hills and valleys and far less vegetation. We were next to the Modi river and the huge boulders in the river seemed almost oversized. It felt like the landscape was becoming wilder and grander, preparing you for the vastness of the mountains ahead. We entered what felt like a scene from Lord of the Rings. There were old trees with sparse vegetation covered in Spanish Moss, a weeping green moss that appears to blow in a non-existent wind. In our slightly inebriated state we headed for the MBC. We made it in good time. There are no hot showers this high up so we just changed into our dry warm clothes, donned our hats and gloves and indulged in a cup of hot sweet milk tea whilst mountain-gazing. We had almost come full circle on the fishtail mountain and she was there in full glory right behind the guesthouse. We turned 180 degrees and there in its magnificence was Annapurna South. Even as the sun was setting we could make out the glaciers that hung on to her sides and settled on to rolling rock formations that protruded before you. Which way to look? Even the valley we had walked up could stake a claim to your eyes as it produced different cloud formations and changed colour with the setting sun. The winner was to be Machhapuchhre. The sun setting on its delicate, stark rock peaks and pristine snow covered sides and ridges, was hard to beat. It felt like you were sat in the presence of one of nature’s greatest offerings. That evening as we sat in the dining room with a kerosene burner at our feet, we met four guys who had just climbed a peak of just over 6000 metres. Two Sherpas had assisted them in the climb. What an achievement. Two other teams were also on expedition; one to climb Annapurna South and another to climb Himachule. None of us slept too well that night. In fact most nights you felt that you had slept lightly – the effect of the altitude. I think this night was altitude and the fact that we knew we were getting up at 3.30am to leave in the 4 ‘o’ clock darkness to ascend the 430 metres to the Annapurna Base Camp (ABC). We probably wore nearly every piece of clothing we had as we trekked to ABC. It was so cold that by the time we had reached ABC, the water in my bottle, runny at 3,900, was ice. It was a tough walk. We set off too fast and the affect of the altitude meant that half an hour in, we were puffing and sweating. We carried on after short break and made it in time to see the sun rise over the Annapurna range. ABC has a few guesthouses at it and many people had got up to see the sunrise. We were sat next to Tibetan prayer flags, strung between little stupas and memorial piles of rocks commemorating someone who had died attempting to climb these mountains. It was a humbling and amazing experience. Milk tea in hand, we sat watching the mountains, waiting for the first glimpse of the sun on this magnificent array of peaks. Annapurna 1 at 8,129 metres was the first peak to show the sun. No less beautiful, if not as tall, the rest of the peaks hosted the sun’s light one, by one until the whole range of mountains were sparkling at us. I don’t know if you could call it life-changing, but it has to be the experience of a life-time. We breakfasted at ABC before our descent and took the opportunity to try our first ever fried mars bar and snickers!! Maybe they should twin with a Glasgow chippy! As Mark reminded us, it wasn’t deep fried in batter, it was shallow fried in pastry. It was great. We consumed this and fried Tibeten bread with honey. We’d left our bags at the MBC, so we packed and set off for our return journey. We stopped that afternoon at 2pm at the Himalaya guesthouse and napped, read books and met other trekkers, including a really nice Australian family, going in the other direction to us. We decided to set-off slightly earlier the next morning and have breakfast at the next guesthouse down. We left at 6 and made Dovan by 7.30 for breakfast. It was a different feeling coming down. I’m sure that seems obvious, but you don’t realise how much the expectation and anticipation lures you forward. When you’re walking away from the mountains it feels a bit heavier and you sort of know what’s coming. We knew we would end that day by climbing those ominous steps we had descended from Chomrong on day three of the trek. Sarah’s strategy as previously mentioned had been to count the steps! We all made it, knee injuries, tight muscles and heaving lungs withstanding. Ed could contain himself no longer; that night we had beer and Pringles before dinner!! We had a really nice evening in the dining-room and met Fran and Dart who were Aussie-English and a couple of Canadian guys, all trekking together. The next morning we were headed for the hot-springs. We climbed down and stopped at a guest house, left our bags and began the half-hour descent towards the Modi river, next to which were natural hot springs. They had captured the hot water in two granite pools and through three pipes coming out of a stone wall. It was the first hot bath Mark and I had had since Turkey, fourteen months earlier! It was lovely to bathe your aching muscles in this hot pool. We also enjoyed the contrast of the cold river crashing over boulders next to us. We were pretty deep in the valley and followed the course of this river onto our next and final guesthouse of the trek; the Beehive. Being the last night of the trek, we indulged again. Beer, Pringles and Raksi, the local wine got us all pretty merry, not least KB. He entertained us that evening with local folk and love songs and very amusing dance with plates! We met a fellow group of trekkers from China who had also been to ABC. Our final day was short, in terms of the trek. We had reached Nayapul, our starting point, in time to catch the 11’o’clock bus to Pokhara. It was a bit strange to come from a place with stunning scenery, no roads, cars, or motorbikes and hardly any people, to a local Nepali bus with music, kids, noise and diesel fumes. It was a quick transition back to the modern world, which included getting laundry done, checking into a new hotel, going back to the van and collecting things, unpacking and re-packing, shopping, showering and relaxing before going for a meal at 7 that evening. Mark and I had been waiting a long time to eat steak at the Everest Steak house. We’d heard mouthwatering reports from other travelers about the fillet steak. We also needed to celebrate Sarah's birthday in a bit more style. The steak was fantastic - it was three months since we'd eaten any meat and we enjoyed it with a lovely bottle of red wine. We had a lovely evening and we all felt thoroughly chuffed with ourselves for having done the trek. We said goodbye to Ed and Sarah the next day. We were so sad to see them go, but what an experience to have had together. We returned to Pame that day to start the slow process of packing up and getting things ready to go. A few last jobs, some issues to resolve on the home-front, the last bicycle rides around the lake, and the last appreciation of this beautiful and green country. The rice has grown in the few months we've been here; in two weeks they can harvest. The countryside is changing colour with the rice, from a deep green to a light green and golden yellow. The weather is changing; sunnier and less rain. We'll miss Nepal, but the beach in India beckons and who knows, maybe we'll come back next year! I sit here in a small travel agents/internet cafe with a cup of milk tea and a chocolate croissant feeling inspired to write to you all. I have in fact forgone my normal breakfast of toast, eggs, spinach, potatoes and tomatoes for a slightly less healthy option, but one that allows me to type. I've even cycled 7.5km (3.5miles) in 20 minutes to get here and write, so, as I sit here sweating, I'm sure you're wondering what could possibly have made me so enthusiastic? The clue is in the title of the entry. This morning was our first sighting of the Annapurna mountains. We woke before 7 and having had a night of no rain and a sunny morning we decided to walk up to the viewpoint just behind where we are camped. We tried not to make any noise as the campsite was quiet, but Amelie and Til's dog Ole was too excited to see us up and had to have at least a few barks! We took him and their other dog Ford with us and with another stray in tow, the five of us followed the footpath over the bridge, up the side of the hill to see the snow-capped peak of the Annapurna for the first time. We sat in the sunshine and just looked in awe at the vastness of the mountain. I think the Annapurna is around 7,800metres high. It's been covered by the monsoon clouds almost everyday for the last few months and you almost start to doubt that there are any big mountains at all. My cycle in around the lake this morning was also beautiful. The monsoon, despite being the worst for a long time has produced, along with the hard labour of Nepali women, beautifully deep green paddy-fields. The hillsides are covered in grass and trees and running with water. We're only 800 metres above sea level in Pokhara, but the hills around the lake climb to 1500 metres and the water is continuously running off them. Terraced farming has been the method used to harness the water, the end result being the continual sound of running water as it is chanelled through different terraces, over and under roads and eventually makes its way to the lake. Is this the most magical combination in the world; snow-capped mountains, deep green hills, cool water and hot sunshine? Anyway, I realise that I should return to the story I left last time. 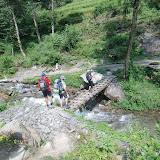 We had just had four weeks in Pame at the campsite and were heading to Kathmandu. We went with Amelie and Til and decided to stop at place called Bandipur, a small town set amid the hill tops 80km from Pokhara. We arrived in the afternoon and found a great place to park where there were two hotels and a huge area of grass at the end of which was a viewpoint of the mountains. The town was a lovely little place and the buildings almost tudor looking. Newari architecture is incredibly similar. The little carved wooden windows and doors, the closeness of the houses, the flagstone streets, all looked like a small village from the middle ages. We had a really nice couple of days there, but the day Amelie and Til were due to leave was a little more fraught with tension. We had parked next to an old water tank. It was a big square hole set into the ground, maybe 2 metres deep, and 15 meters across both way. They are still used in many places for people to wash and do their laundry. The sides of the tank are exactly the same as the dry stone walling you get at home. We had both parked next to this tank and the two days we were there it had rained very heavily. Amelie and Til were due to leave at 6 in the morning to get to Kathmandu. We heard their engine start and then had a frantic knock on the door with Amelie asking Mark to help them. We both got up and couldn't believe our eyes. Their truck; a great big 8 tonne green Mercedes 911 beauty was precariously tilted on one side where the wall of the tank had fallen away as they'd tried to reverse out of their parking spot. The combination of the sodden ground and the weight of their truck had made the tank collapse. The frog (it looks like one!) was not looking good. It wouldn't be an exageration to say it was tilted at a 45 degree angle. All 8 tonnes of it. We knew we couldn't tow it out as we only weigh 4.5 tonnes max, but we instead tried to act like an anchor but attaching our winch at the back and then tying more straps around trees to try and stop it from falling in. I had to go into the local town to try and find some oil for the winch, but instead I found through some other local Nepalis a guy who claimed to have a ten-tonne winch. We all returned to the truck and the guys had to dig a deep hole 3-4 metres in front of the truck and then tied the winch rope wround a tree trunk and burried it at least a metre deep. The truck was then winched forward. At least at this point if felt like it was safe and no longer about to fall. After lunch however, with the lead guy of the winching team enjoying a few bevvies, they asked Til to just reverse the truck out. It was madness as he would have fallen straight back into the same position. Mark had a brainwave - put some wooden boards underneath the wheels, squirt them with washing-up liquid and then winch the truck sideways, sliding on the boards. It worked, but not after Mark had been smacked accidentally in the face with a wooden plank! It's all healed now, but I'll let him tell that story. It took us 13 hours to get that truck into a position of safety. The next day we all left for Kathmandu. I had manged to get a guava seed jammed into my tooth and needed to get it seen to! First impressions of Kathmandu - filfthy and polluted! But then we were staying at a car workshop just down the road from a dump! Having had a small glimpse of a few of Kathmandu's sights, having walked among the beautiful architectire of the Durbar Square in Patan, and having been lucky enough to see the Himlayan range that surrounds the city's namesake, the Kathmandu valley, I can really see how people's stories of arriving here in the 1970s when there were no cars and no pollution made this city into the Shangri-La that it once was. It must have been amazing. I don't wish to do it a disservice today. It's a city that's worth looking at. The temples, the shops, the architecure, the people and the mountains are still a great combination, but it does give you an idea of how unplanned and rapid development can lead to environmental damage. Reports in the papers last week were of urban pollution collecting around mount Everest. We donned face masks to cycle around the city. Our three week stay at Irwins workshop was under a shelter and we were with friends. Mark had all sorts of jobs to do on the van and we managed to get (after two attempts) our alternator repaired. It may seem like we have done a lot of maintenance on the van, and I suppose we have, but the poor thing does take a battering and has driven 25,000km (approx 13,000miles) in the last year, over some very bumpy terrain! She's an old girl too, having been born in 1993! So, our stay was longer than expected, and resulted in Mark getting a bad cough from the pollution - it's almost better now. It was the arrival of our friends that precipitated our departure. We all met in Goa last year on the beach: Amelie and Til, me and Mark and Mandy and Steffen. Steffen, some of you may recall, is the mechanic that helped Mark on the van in Goa. They were arriving from Australia and picking up their van before we could all spend 10 days together back in Pame. Those ten days have gone now, they were great- and it was quicker than we all wanted, but the bain of all travellers lives; visa restrictons, made it so. They're on their way to the border now and heading for India and then home. When we returned to Pame we had new neighbours. Stefan and Petra with their dog and Patrick and Marion with their two children and dog. Both of them own incredible vehicles; Stefan and Petra's is a 6-wheeler, 19 tonne truck that he took 5 years to build and Partick and Marions houses a whole family; brilliant! So folks, I guess that's all for now. We are eagerly awaiting the arrival of our cousin Sarah and Ed. It's 9 days til they land in Nepal. Between then and now, I guess it will be more of the same; cycling, walking, swimming, reading, raining, sunshine, mountains, clouds, greenness, lakes, temples and nice breakfasts. In the words of Jill Scott, I feel like I'm living my life like it's golden! A big and long awaited hello from Kathmandu! You'll be pleased to know that we've made it to Nepal. In fact for most of you it's old news! Our friend Nick has said that our blog is fast becoming a historical document - apologies again! The drive here was mammouth - I think we've clocked up almost 3000km between us. To try and maintain some sort of chronological order to the blog, I'll deal with the journey first and then Nepal. I hope it's not too boring - it's better when it's fresher! We last left you when we had departed from a very wet Goa. We visited our old camping spot in Agonda and found everything closed. The restaurant and bar owners had dismantled nearly every beach hut and in the permanent structures the hatches had well and truly been battoned down. It was wet, deserted and wild. Nothing like the winter idyll we'd grown to love. The monsoon is all pervasive. Everything feels damp all the time and it takes 3-4 days to dry any washing! We had thought to spend 2 days relaxing before we left, but it really wasn't the weather! So we set off; gently at first, only doing 200km on our first day and setting off at 10 and finishing at 4. We had thought to drive through the centre of India but heard that the roads were bad. Time wasn't really on our side so we decided to go on the highways. The four major cities of India; Mumbai, Delhi, Kolkata (Calcutta) and Chennai (Madras) are linked up with a quadrangle of pretty good highways.We decided to head for Dehli and then cut east towards Agra - where the Taj is - and then over to Varansi before heading north into Nepal. After a day's driving we had reached the highway and our lifestyle for the next two weeks was established: up at 6-7, coffee, drive for two hours, breakfast, drive until just before sunset, 6ish, stop at a motorway services, eat, wash and in bed asleep by 8! The motorway services are not quite what you may think of at home. They are usually pretty close to the road and most nights we needed earplugs to sleep. We swap driving every two hours so that neither one of us gets too tired. We quite liked the sense of purpose that we got from being back on the road again. Sad, I know! There are few things about the drive that are of interest here, but some are worth mentioning. We stopped at Pune on the way up as we had concerns about the tyres. The tread was wearing unevenly and after we had spotted it we decided to stop in Pune in case we needed to change them or something. Pune is just east of Mumbai and is a city of 3 million. It has a huge student population and is a really nice city. Its also famous for the Osho Ashram - Osho was deported from America after they questioned some of his methods - google it! Anyway, we stopped on the outskirts of Pune by the race course as it seemed quiet and had space. A couple of people had told us we may have problems as there was a military base nearby and they patrolled at nighttime. After the third person stopped and spoke with us we thought we maybe we should move. Fortunately for us the third set of people to stop were Tushar and Nita who lived not far away and said we could park near them. We followed them home and parked outside their apartment. They were on their way to the hospital where they do voluntary work with burns victims. They left us to it and invited us for breakfast the next day. Such hospitality - can you imagine meeting two foreigners on the street and taking them home and making them breakfast?! The breakfast was lovely - Nita is a great vegetarian cook. Both her and Tushar are Jains (pronounced jay-een). Over breakfast we were educated about Jainism and learnt about the voluntary work that they do in the hospital. The government hospitals are, by all accounts, underfunded and in a poor state. The burns wards are some of the worse. Many people here cook with kerosene stoves- many of which are faulty - and are consequently burnt - badly. Tushar and Nita decided they wanted to give something back to their local community and decided that every other night they would visit the ward and help people. Great people whom we were very fortunate to meet. Tushar showed us the way out the next day and we were on our way towards Mumbai. I couldn't possibly do that city any form of justice by describing driving through it, so we'll leave that one til after we've actually stopped there! We headed on past Mumbai and towards the next state of Gujarat. As we were heading north the temperature was starting to climb and it was becoming more humid. The night times were the worst. The days weren't so bad as we were heading north and only had the sun in the cab in the early morning. We also had a constant breeze pouring in through the windows. But, when we hit Jaipur in Rajasthan and started heading East towards Agra the temperature was very uncomfortable. We lay in bed sweating as if we'd both been out for a hard run! It was around this time that we started to question the wisdom of visiting Varanasi. We changed plans and headed towards cooler climes. Lucknow, the capital of Uttar Pradesh was our final two day stop in India before heading for the border. Lucknow was a major centre for the British Raj, has some great architecture and is a typical busy Indian city. We picked up provisions there as we had heard that most things in Nepal were more expensive. We also needed, so we thought, American dollars for the Nepali border. This proved impossible to organise as the Indian government says that Nepal takes Indian Rupees and has forbidden the buying of dollars in India to go to Nepal. Rupees in hand we headed north. After 14 days of solid driving we crossed the border into Nepal at Nepalganj. We had no real problems getting our visa once the guy realised it was Rupees or nothing! We slept that night just across the border and it was definitely cooler. We were so looking forward to a good night's sleep but a young Nepali guy had other ideas. He was a very well educated and clever young man who was desperate to practice his English. He knocked on our van door every hour from 6 to chat with us! Driving in Nepal felt like a walk in the park in comparison to India. We hardly saw any trucks on the road, in fact hardly any traffic at all. We actually said it was like driving through Longleat safari park - without the Lions! We were following the base of a set of hills below the Himalaya that run from west to east. Pokhara was our destination as our friends Amelie and Til whom we met in Goa were there. After a few days driving we had only seen low lying hills, but as we started to head north towards Tansen we started climbing. The scenery was beautiful and we hadn't even seen any big mountains yet! Pokhara is the second largest town in Nepal and boasts a stunning backdrop; the Annapurna himalayan range. We, however have seen these mountains once in 6 weeks! The monsoon clouds are keeping an almost permanent curtain infront of the mountains and we eagerly await the opening night - or day, as it were! Pokhara's mountain backdrop and its huge lake make it a really popular toursit destination, but again the monsoon has kept most toursists away. So, what can you do during the monsoon? Walking and cycling have been the two things keeping us most busy, as well as using inner tubes to float on the lake. We spent the first week camped in the town next to the lake and got some little jobs done on the van and met some of the few travellers and tourists left in the Sun Welcome restaurant. You couldn't cook for as little as the price! We also met some paragliders here. Pokhara is one of the capitals for paragliding -you can imagine the views. Mark had his first flight, which he may come on here and explain - brilliant! I'm waiting til October when everything is just a little clearer. After a week our friends Amelie and Til arrived from Kathmandu and we drove 10km around the lake to a small village called Pame where, based at the end of the valley is an overlanders campsite. However to reach it we had to do our first river crossing - again we'll put the photos up later, but suffice to say we made it. Although we did wonder whether camping in between two rivers at the base of the valley was the wisest thing to do in the middle of the monsoon! We spent 4 weeks camped here in our very own private bog! The ground was so wet and muddy from the perpetual rain. But, we had many days where it was sunshine - in fact most time the rains came it was in the night. So, we took inner tubes and floated down the rivers nex to us and walked back (thanks Rob and Sagar), cycled in and out of Pokhara, washed in the stream running next to the campsite (Mark said he felt as if he were in an advert for hair products - leave you feeling fresh as a mountain stream!! ), walked up the closest mountain - Sarangkot with our bikes and then rode down the other side, walked to the world peace stupa and got the boat back accross the lake, and shared great food and lots of fun with Amelie, Til, Ole and Ford (two dogs!). After 4 weeks Kathmandu was calling, but that can wait for the next instalment. Back sooner rather than later - promise! We're off! Ok, so whats it all about? Well we have decided to emabark on a trip of a life time and drive to Asia. Yes, we are leaving our lovely, lovely home in London and our wonderful friends and family. The van is an 1993 iveco 4x4 that has been converted into a camper by myself and mainly the bearded man (my dad) with help from other along the way. In the pics you can see Stu and Caroline tinting windows and adding those lovely sunflowers that make everyone smile as we go by. You can also see Dad removing the roof for the pop top. So why are we taking this is trip? The simple answer is that life is too short and we are in the very, very fortunate posistion to be able to.